After reading that post a bit better, it became clear to me that Behringer was actually producing the chips themselves, which would mean that soon we should have two different recreations available of the classic CEM3340! I honestly hope this statement means Curtis Electromusic will actually step up and start producing more recreations of their old chips! In a previous post in their Facebook page, they mention that high eBay prices alone is not an adequate motivation to remake those chips, as it will require them a considerable investment to actually re-issue those chips. Personally, I think there was enough demand already to justify a re-issue of those classic chips, which was just confirmed by all the reactions I've been seeing to the latest news from Behringer. These chips are not only essential to repair some truly classic machines, they can also be used to create amazing new machines. I honestly believe that, if there is a solid supply of these chips for fair prices, lots of small companies that focus on creating new analog gear would be more than interested in using these chips in their new machines, which should be enough for them to make a nice profit out of those chips. Let's face it, analog synths are here to stay and I honestly don't see the demand for those chips to go down anytime soon, like what happened when digital synths started to appear. The big question now is, are these recreations accurate? But how will Behringer's new chip compare with the original CEM3340? 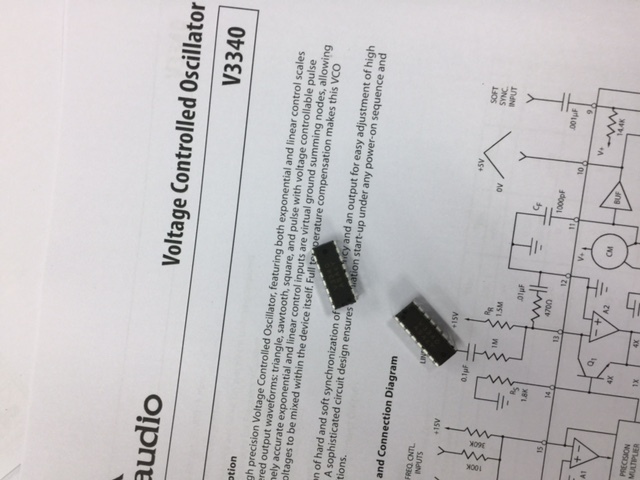 As a last note, Behringer's chip seems to be called V3340, as it can be seen in the photo Uli Behringer shared in his post about CEMs and that I share again now. This is clearly a good step to distance themselves from the Curtis name, which was one of the complains made by Curtis Electromusic. So, I will be waiting to hear the new V3340 chip before making further comments, but if their recreations are faithful (like the one from Curtis Electromusic seems to be), exciting times are waiting for us! EDIT - Some more info about the V3340 is already available at CoolAudio's website! They are a company from the Behringer group and the ones producing this chip. From what I could read online, the quality of their products seem to be pretty high and lots of companies seem to be using their chips nowadays.